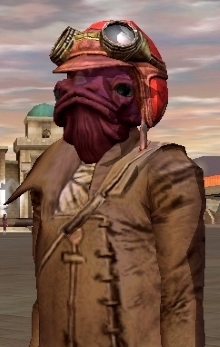 One month after the launch of Star Wars: Galaxies a scrawny Mon Calamari stands in an Imperial player-created city, hands at his sides and large vacant eyes also at his sides. A sign proclaiming "BACTA: DA FUTURE" marks the town's medical clinic. On a nearby balcony a hapless tourist yells for help, imprisoned by the home's owner. The tourist-prisoner's panicked shouts become furious strings of expletives as the townspeople go about their routines without so much as a concerned upward glance. The prisoner vanishes, disconnecting, then reappears some minutes later to begin the cycle anew. The Mon Calamari considers his options for the day, and they are overwhelming. He considers where those options might lead, and realizes he has absolutely no clue. He allows himself the pleasure of lingering in this nexus of unknown consequences for a few moments as the balcony prisoner - fresh off a tirade of elaborate but impractical death threats - switches tactics to wheedling private messages. A crowd gathers at the shuttleport. Eventually this cluster of dancing, jumping, arguing, half-naked chaos will become an expedition. An expedition with no consideration of class roles, damage meters, itemization, or destination. The Mon Calamari steps into the mob's gravitational pull. His goal for tonight is to watch his idiot guildmates get themselves killed, not considering for a moment that he might also be an idiot. I marvel as my newly-created Mon Calamari lies prone in a patch of tall grass. Prone! You can't even do that in Rainbow Six: Rogue Spear! How the heck are they pulling off this level of tactical realism in an MMO? All characters are generalists, free to invest in skills from professions as diverse as Politician, Brawler, and Entertainer. If there are optimal builds no one is close to discovering them yet. I like laying down. Snipers get to lay down in combat. I'll start with the Marksman tree. Done. That's my entire plan. Aside from the fact that I'm on the planet Naboo, that's also everything I know about the game. The guild chat scrolls past in a blur, almost too fast to read. No one is entirely sure what's possible in the game. Our collective giddiness is palpable. One guild member lays out explicit plans for taking advantage of the burgeoning economy. In the coming months this person evenly splits their in-game time between a crafting table and a trading kiosk less than twenty yards away. Another guild member speculates on the droids he'll be able to craft. Protocol droids, gonks... maybe an entire zoo of droids with their own personalities! Someone else jokes about their (100% serious) plan to earn credits and gifts by dancing in a cantina for horny players. The chat gains momentum by the hour, a meandering stream of wild theories about spaceships, hidden treasures, unlockable Jedi, and interplanetary exploration. We convince ourselves the highly specific experiences we seek are waiting to be discovered. The game's mechanics have not yet slammed down across our imagined paths. Unobstructed, our view stretches beyond the half-made horizon, our minds filling in the faintest hints of shapes to come. My character takes in the majesty of this game's future, his enormous eyes unblinking. While laying prone, of course. Amidst the guild chatter, one player who just logged out of the World of Warcraft beta gushes about that game's potential. Most of us who just spent $60 for Star Wars: Galaxies treat this enthusiasm with suspicion. In the weeks to come we continue to do what we're best at: Not understanding anything. We build resource collectors in a field below the plateau of Theed. Not because we know what the resources can ultimately be used to build or fuel, but because having resources seems like a good idea. This is where we build our town. No one knows if Jedi are actually in the game. Maybe they're a hidden feature, a midi-chlottery to be won if you stand in the right place or unlock the right combination of skills in a specific order. Our hunting expeditions mainly involve waiting in starports, arguing about our destination, and dying immediately after shooting our blasters at a high-level rancor. No one has a "Collect Rancor Hides" quest. Most of us aren't sure if there's even a story in the game. There's one thing we figure out very quickly: How to trap people in our player-owned properties. By default a home's owner is the only individual who can enter. What you do is invite someone in (adding them to your list of permitted guests) and talk them into joining you on the second floor balcony. As soon as they step into the open air, you remove them from your guest list. The hydraulic door slams shut and locks behind them. Now they have no way to get down from the balcony, which the game considers part of the outdoors. The handrail is too high to jump over or climb. There is no fast travel or hearth system. The prisoner can only hope for mercy or the intervention of a GM. I'm pretty sure this is how Mace Windu died. Don't give me that look. I saw the movie. Every game begins as a blank canvas for the enthusiastically splattered broad strokes of our expectations. As we play the details emerge and coalesce into someone else's vision. Sometimes the Ecce Homo in our mind becomes a botched restoration. Sometimes it's the other way around. Sometimes the botched restoration is better in ways we hadn't anticipated. There is something unique about that space between what we desire and what's actually there. What we find there is personal, unpredictable, and equally influenced by players and creators in ways neither can control. MMOs are sprawling ridiculous things, introducing concepts over such a protracted stretch of time that it's possible to linger in this in-between space for weeks before all the details take shape. These games may set out to be about ancient evil dragons or pirates or spaceships, but by their very nature they are actually about discovery. At least for a time in that first "free" month. This is why shut-in nomads like me are still out there, hopping on every new MMO that comes along. We're not chasing a WoW-killer. We don't care about any given game's relative popularity or its long-term endgame picture. All we want is a few more weeks of clueless wandering. It's the 20th Anniversary of My Quake 2 David Letterman Skin! Battlefield: Bad Company 2 Patch 1.1 Released!!! If a Writer Freelances in the Internet, Does It Make a Resume?